Mexico is one of the largest producers of petroleum and other liquids in the world, the fourth-largest producer in the Americas after the United States, Canada, and Brazil, and an important partner in U.S. energy trade. 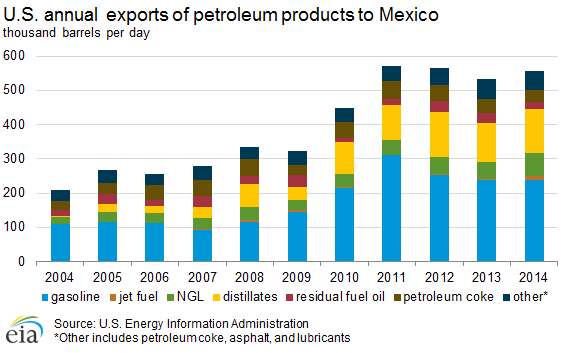 In 2014, Mexico accounted for 781,000 b/d, or 11% of U.S. crude oil imports. Mexico’s oil production has steadily decreased since 2005 as a result of natural production declines from Cantarell and other large offshore fields. 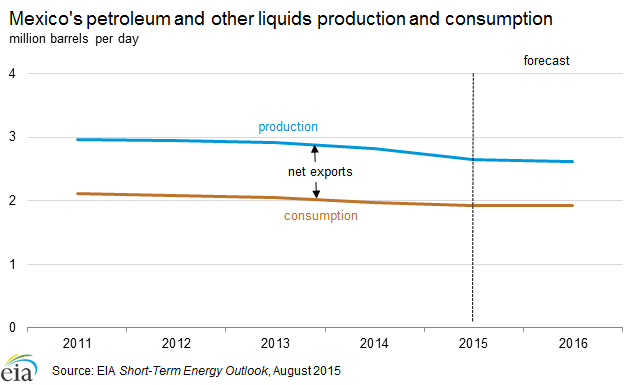 The rate of total production decline has slowed in the past several years. In December 2013, in an effort to address the declines of its domestic oil production, the Mexican government enacted constitutional reforms that ended the 75-year monopoly of Petroleós Mexicanos (PEMEX), the state-owned oil company. Oil is a crucial component of Mexico’s economy. The oil sector generated 11% of the country’s export earnings in 2014, a proportion that has declined over the past decade, according to Mexico’s central bank.1 More significantly, earnings from the oil industry (including taxes and direct payments from PEMEX) account for one-third of total government spending.2 The 2015 federal budget was based on Mexican crude oil being valued at $79 per barrel, although Mexican Maya crude oil averaged less than $50 per barrel through the first seven months of 2015.3,4 Declines in oil production have a direct impact on the country’s economic output and on the government’s fiscal health, particularly as refined petroleum product consumption and import needs grow. 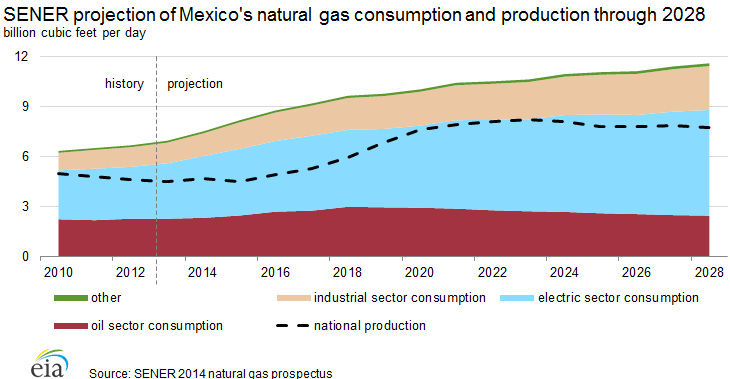 Mexico’s total energy consumption in 2014 consisted mostly of petroleum (45%), followed by natural gas (40%). 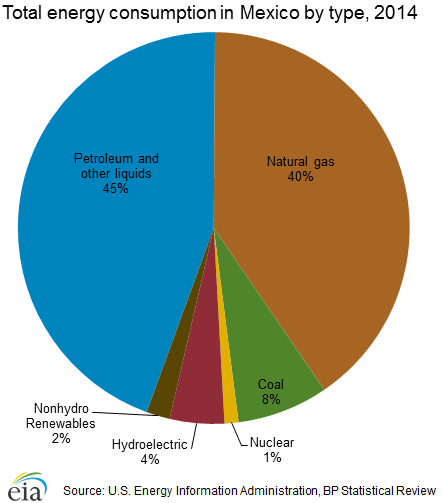 Natural gas is increasingly replacing oil in electric power generation. However, because Mexico is a net importer of natural gas, higher levels of natural gas consumption will likely depend on more pipeline imports from the United States or liquefied natural gas (LNG) imports from other countries. 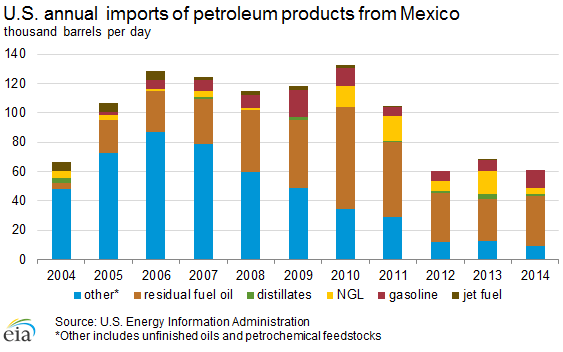 All other fuel types contribute relatively small amounts to Mexico’s overall energy mix. The country also has growing geothermal and wind energy capacity for electricity generation. Mexico’s oil production has declined in recent years, as has its position as a net oil exporter to the United States. 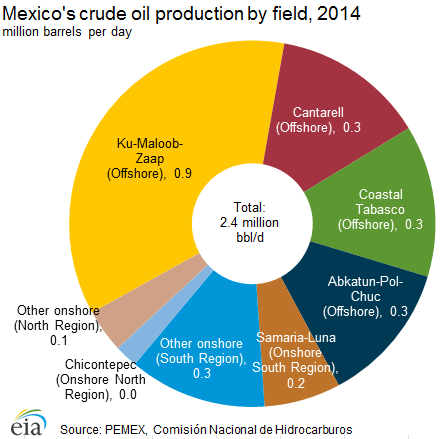 Mexico produced an average of 2.8 million barrels per day (b/d) of petroleum and other liquids during 2014. Crude oil accounted for 2.4 million b/d, or 87% of total output, with the remainder attributable to lease condensate, natural gas liquids, and refinery processing gain. Mexico’s total oil production had been declining substantially, 27% from its peak in 2004. Notably, crude oil production in 2014 was at its lowest level since 1986 and has continued to decline thus far in 2015. Mexico is a significant crude oil exporter, the third largest in the Americas, but the country is a net importer of refined petroleum products. Mexico’s largest trading partner is the United States, which is the destination for most of its crude oil exports and the source of most of its refined product imports. More information on Mexico’s oil production in the context of production in the Americas can be found in the U.S. Energy Information Administration (EIA) report on Liquid Fuels and Natural Gas in the Americas. Mexico nationalized its oil sector in 1938, and PEMEX was created as the sole oil operator in the country. PEMEX is the largest company in Mexico and one of the largest oil companies in the world. Mexico’s energy sector is regulated by the Secretaría de Energía (SENER). Comisión Nacional de Hidrocarburos (CNH) provides additional oversight of PEMEX and its oil and natural gas activities. After years of declining production, Mexico instituted significant energy reforms. In December 2013, the Mexican government enacted constitutional reforms ending PEMEX’s monopoly on the oil and natural gas sector and opening the industry to greater foreign investment. The reforms allow for new exploration and production contract models: licenses, production-sharing, profit-sharing, and service contracts. Previously, only service contracts, in which companies were paid for services and were not allowed shares or profits derived from the hydrocarbon resources, were allowed for foreign firms. PEMEX will remain state-owned, but it will be given more budgetary and administrative autonomy and will have to compete for bids with other firms on new projects. As stipulated by the reforms, PEMEX was allowed first refusal on developing Mexican resources before private companies began bidding. This phase was known as Round Zero and resulted in PEMEX being awarded the right to develop 83% of the country’s proved and probable oil reserves.5 The reforms also call for expanding the regulatory authorities of SENER and CNH, and for creating a new environmental protection agency, the Agencia de Seguridad, Energía y Ambiente (ASEA). In July 2015, the first auction phase of Round One offered 14 offshore blocks for exploration and production to private investors. Because of low crude oil prices and the terms of the contracts, only 2 of the 14 blocks received adequate bids to be awarded. A consortium of three companies, Sierra Oil & Gas, Talos Energy, and Premier Oil, was awarded the second and seventh block of the auction.6 Subsequent phases of Round One were postponed as CNH adjusted rules surrounding the auctions to promote more bidding on the offerings. The fourth phase of Round One includes the lucrative deepwater blocks and is expected to draw more attention from the major international oil companies. The fifth phase of bidding, which offers shale and other nonconventional tenders has been suspended. According to the Oil & Gas Journal (OGJ), Mexico had 9.8 billion barrels of proved oil reserves as of the end of 2014. Most reserves consist of heavy crude oil varieties, with the largest concentration occurring offshore of the southern part of the country, particularly the Campeche Basin. There are also sizable reserves in onshore basins in the northern parts of Mexico. Most of Mexico’s oil production occurs off the eastern coast of the Bay of Campeche in the Gulf of Mexico, near the states of Veracruz, Tabasco, and Campeche. The two main production centers in the area are Cantarell and Ku-Maloob-Zaap (KMZ). In total, approximately 1.8 million b/d—or three-quarters—of Mexico’s crude oil is produced offshore in the Bay of Campeche. Because of the concentration of Mexico’s oil production offshore, tropical storms or hurricanes passing through the area can disrupt oil operations. More than half of Mexico’s oil production comes from two offshore fields in the northeastern region of the Bay of Campeche—Ku-Maloob-Zaap (KMZ) and Cantarell. Another important source of oil production is southwest in the same bay, offshore the state of Tabasco. Most of the oil produced at KMZ and Cantarell is heavy and marketed as Maya blend, while the oil produced offshore Tabasco is a lighter grade. KMZ, which is adjacent to Cantarell, has emerged as Mexico’s most prolific oil field. Crude oil production nearly tripled between 2004 and 2013, when it reached 864,000 b/d, as PEMEX used a nitrogen reinjection program similar to that used at Cantarell. PEMEX hopes to increase output further over the next few years, in part through the development of the anticipated 150,000 b/d Ayatsil satellite field, although views differ about whether the KMZ complex has already reached peak production. Mexico is believed to possess considerable hydrocarbon resources in the deepwater Gulf of Mexico that have not yet been developed. PEMEX has been drilling deepwater exploratory wells since 2006, making its first significant find in the Perdido Fold Belt, near the U.S. maritime border, in August 2012. In February 2012, the United States and Mexico signed a Transboundary Hydrocarbon Agreement concerning the development of oil and gas reservoirs that extend across their maritime border.12 The agreement established a cooperative process and legal framework for safely managing and jointly developing transboundary reserves, and it ends the current moratorium on exploration and production in the transboundary area. The most notable onshore prospect in the north is the Aceite Terciario del Golfo (ATG) project, better known as Chicontepec, which is located northeast of Mexico City. PEMEX has heavily invested in and promoted Chicontepec as a potentially significant source of future production, with 637 million barrels of proved crude oil reserves and 15 billion more barrels of probable and possible reserves. Despite its potential, production in Chicontepec averaged only 49,000 b/d in 2014, a decline from 2013.14 Chicontepec has not lived up to expectations because of the unique technical challenges associated with its development. In fact, Chicontepec is not a single field but a formation with dozens of small fields spread over hundreds of square miles, which are highly fractured and at low pressure. As a result, many costly development wells are necessary, recovery rates are low, and decline rates are high. Moreover, the region does not yet have much of the supporting infrastructure necessary for large-scale oil development. PEMEX hopes to significantly increase production through an aggressive drilling program, aspiring to produce 300,000 b/d from Chicontepec by the next decade. However, many industry analysts expect production to peak far earlier, and at a much lower level, without significant foreign investment. Mexico’s energy regulator, CNH, has raised concerns about the project’s profitability and PEMEX’s development plan, given that Chicontepec accounts for a significant share of the company’s exploration and production budget. Mexican authorities reported that the country exported 1.14 million b/d of crude oil in 2014, a figure that continues to decline.15 The United States received approximately 68% of Mexico’s oil exports, which arrived by tanker.16 Most Mexican crude oil exports to the United States are Maya blend, while Mexico retains most of the output from its lighter crude streams (Isthmus and Olmeca) for domestic consumption. The United States is likely to attract the bulk of Mexico’s oil exports because of the proximity and the operation of sophisticated U.S. Gulf Coast refineries capable of processing heavier Maya crudes. Mexico is typically among the top three exporters of crude oil to the United States. In 2014, the United States imported 781,000 b/d of crude oil from Mexico, behind Canada and Saudi Arabia. Mexico’s crude oil exports to the United States rose steadily through the 1980s and 1990s, before peaking in 2004 at 1.6 million b/d. U.S. crude oil imports from Mexico have generally declined since 2006, reflecting Mexico’s steady drop in crude oil production and rising fuel demand, along with dramatic increases in U.S. production in recent years. In August 2015, the U.S. Department of Commerce approved the sale of crude oil from the United States to Mexico.17 Shipments of high-quality crude oil will be sent to Mexico in exchange for equal volumes of Mexican heavy oil. 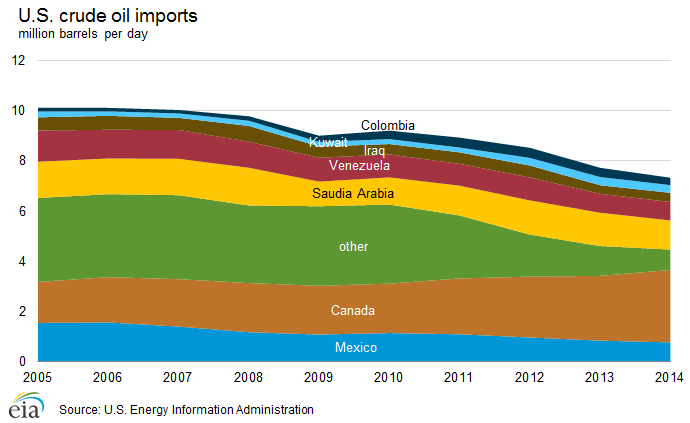 This exchange provides a better crude oil supply for each country’s refining configuration. Such swaps are considered legal exemptions to the U.S. law banning the export of crude oil. In 2014, Mexico exported 201,000 b/d of refined petroleum products.20 The United States imported 61,000 b/d of that total, most of which was residual fuel oil, naphtha, and pentanes plus. As with crude oil, U.S. imports of refined petroleum products from Mexico have declined in recent years, from a high of 132,000 b/d in 2010. PEMEX operates an extensive pipeline network in Mexico that connects major production centers with domestic refineries and export terminals. According to PEMEX, this network consists of pipelines spanning more than 3,000 miles, with the largest concentration occurring in southern Mexico. Mexico has no international oil pipeline connections. Most of its exports are shipped by tanker from three export terminals on the Gulf Coast in the southern part of the country: Cayo Arcas, Dos Bocas, and the Pajaritos terminal at the port of Coatzacoalcos. There is also an export terminal on the Pacific Coast at Salina Cruz. Mexico had six refineries, all operated by PEMEX, with a total refining capacity of 1.54 million b/d as of the end of 2014.23 According to PEMEX, refinery output was 1.39 million b/d in 2014, a decline from 2013.24 PEMEX also controls 50% of the 334,000 b/d Deer Park refinery in Texas. Mexico hopes to reduce its imports of refined products by improving domestic refinery capacity. In February 2012, PEMEX awarded a contract for the design of a new refinery at Tula, but in December 2014 opted for a $4.6 billion expansion of the existing facility. Gasoline and diesel production will increase from 140,000 b/d to 300,000 b/d at Tula.25 Despite this and other expansions, analysts contend that Mexico does not have a natural competitive advantage in refining, given the country’s close proximity to a sophisticated U.S. refining center. Some feel that it would be more productive to apply PEMEX’s limited capital to the upstream sector. 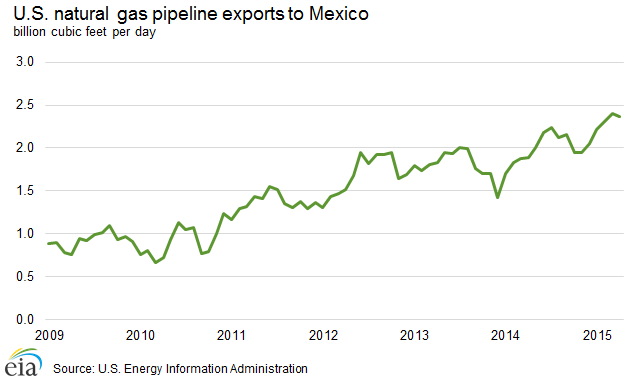 Mexico is a net importer of natural gas, mostly via pipeline from the United States, and its natural gas demand is rising because of expanding power generation capacity. Mexico has considerable natural gas resources, but its production is modest relative to other North American countries (See Liquid Fuels and Natural Gas in the Americas). The development of its shale gas resources is proceeding slowly, while consumption is projected to increase 64% from 2013 to 2027. Mexico’s import needs are rising as domestic production stagnates and as demand increases, particularly in the electricity sector. Consequently, Mexico will rely on increased pipeline imports of natural gas from the United States and liquefied natural gas (LNG) from other countries. 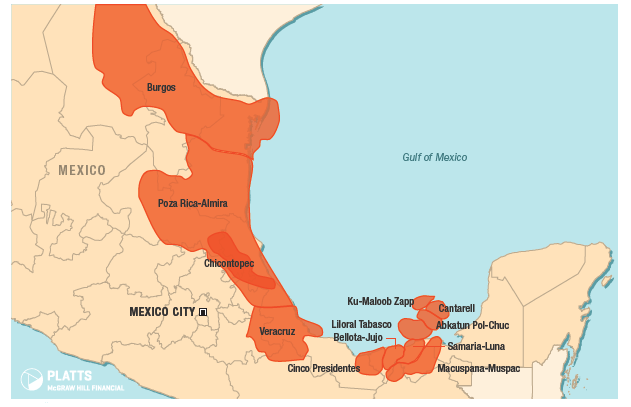 According to the Oil & Gas Journal, Mexico had 17 trillion cubic feet (Tcf) of proved natural gas reserves at year-end 2014.26 Although the southern region of the country contains the largest share of proved reserves, the Burgos region in the north has the potential to be the center of growth in future reserves, as it contains 393 Tcf of technically recoverable shale gas resources.27 Mexico has one of the world’s largest shale gas resource bases, which could support increased natural gas reserves and production. According to the EIA’s assessment of world shale gas resources, Mexico has an estimated 545 Tcf of technically recoverable shale gas resources—the sixth largest of any country examined in the study. The figure of technically recoverable shale gas resources is far smaller than the total resource base because of the geologic complexity and discontinuity of Mexico’s onshore shale zone. Most of Mexico’s shale gas resources are in the northeast and east-central regions of the country. The Burgos Basin, which accounts for most of Mexico’s technically recoverable shale gas resources, is considered to be Mexico’s most promising prospect for natural gas production in the future. Before the energy reforms of 2013, PEMEX retained a monopoly on natural gas exploration, but the government allowed private participation in nonassociated gas exploration and production. The Mexican government opened the downstream natural gas sector to private operators in 1995, although no single company may participate in more than one downstream function (transportation, storage, or distribution). The Comisión Reguladora de Energía (CRE) was created to monitor the sector. As it applies to the oil sector, the newly enacted energy reforms allow for greater outside investment in exploration, production, and other activities in the natural gas sector. The reforms allow for new exploration and production contract models: licenses, production-sharing, profit-sharing, and service contracts. PEMEX will remain state-owned but will be given more budgetary and administrative autonomy and will have to compete for bids with other firms on new projects. The reforms also call for expanding the regulatory authorities of SENER and CNH, and creating a new environmental protection agency, the Agencia de Seguridad, Energía y Ambiente (ASEA). 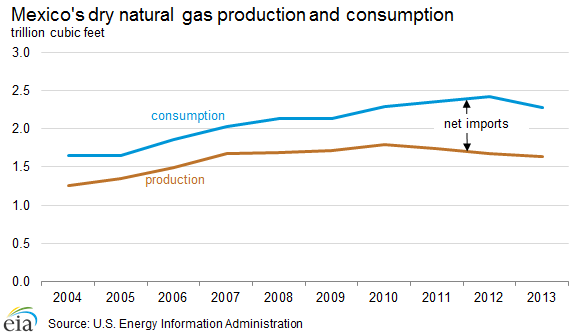 Mexico produced an estimated 1.6 Tcf of dry natural gas in 2013, a modest decline from the year before. Part of the decline is in response to the relatively higher price of crude oil relative to the price of natural gas, which encouraged PEMEX to favor development of oil. CNH reports that approximately 147 million cubic feet per day of natural gas was vented and flared in 2014, slightly less than 30% of which occurred at Cantarell.29 PEMEX and government agencies have prioritized a reduction in natural gas flaring for economic and environmental reasons. Efforts to improve the ability to capture, process, and transport associated natural gas production, particularly at Cantarell, have been effective and gas utilization rates have recently increased. The geographic distribution of Mexico’s marketed natural gas production is slightly different and more dispersed than it is for oil. According to statistics from Mexico’s CNH, more than two-thirds of Mexico’s natural gas production in 2014 was from associated oil fields. Unlike in the oil sector, the onshore (Samaria-Luna) and offshore fields of Tabasco yield more natural gas than Cantarell or KMZ. More than two-thirds of the country’s nonassociated natural gas production occurred in the Burgos Basin in the northern part of the country; most of the remainder was from nonassociated fields in Veracruz. Mexico has taken preliminary steps to explore for and produce shale gas, but the country lags the United States considerably in terms of the development of its shale gas and tight oil potential. PEMEX produced its first shale gas in early 2011 from an exploratory well in northern Mexico. Later that year, the government announced a significant discovery in the same region, which could significantly increase the country’s proved natural gas reserves. PEMEX announced in early 2014 that it planned on drilling 10 shale test wells, bringing Mexico’s total to 175, a small figure compared with the more than 27,000 wells drilled across the border in Texas in 2014.30 Although PEMEX has allocated a small share of its budget to shale gas development, the sector is unlikely to grow rapidly without improvement in PEMEX’s financial situation, technical abilities, and terms for investors. However, new rules set by the energy reforms could allow entry of foreign firms to initiate significant development of Mexico’s shale gas resources. 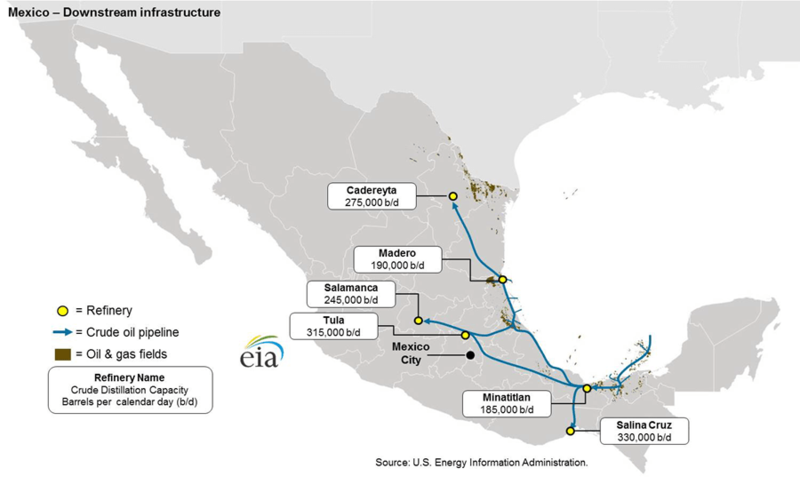 Because of pipeline constraints, Mexico has to meet some of its natural gas demand with liquefied natural gas (LNG), importing 329 Bcf of LNG in 2014.35 With pipeline capacity expansions, LNG imports are expected to peak soon and fall by almost half by the end of 2016 as cheaper natural gas from the United States will displace more expensive LNG imports and could possibly lead to LNG exports from Mexico. Mexico is investing in new power plants to increase electricity generation capacity and transition to natural gas as the main fuel source. Electricity trade between the United States and Mexico has existed since 1905, when privately-owned utilities located in remote towns on both sides of the border helped meet one another’s electricity demand with a few cross-border, low-voltage lines. Over the years, both countries developed highly regulated and structured electricity sectors, and major and minor cross-border transmission lines were constructed. For a variety of technical and market reasons, however, U.S.-Mexico electricity trade has remained small. 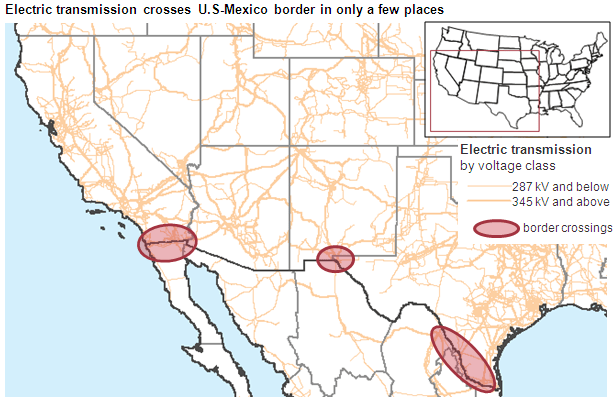 Existing electrical interconnections between Mexico and the United States are relatively limited in capacity and are operationally constrained by nonsynchronous cross-border ties, except in the Southern California-Baja California region. Mexico has been a modest exporter of electricity to the United States since 2003. In 2013, Mexico exported 7.8 million kWh to the United States, or 11% of total electricity imports.40 Electricity sales from Mexico to the United States could increase in the midterm, as the U.S. Department of Energy recently issued a presidential permit for construction of a transmission line across the U.S.-Mexico border. When completed, the transmission line will supply electricity from a Mexican wind farm to the California market. Mexico also exports smaller amounts of electricity to Belize and Guatemala. The state-owned Comisión Federal de Electricidad (CFE) is the dominant player in the generation sector, controlling more than three-quarters of the country’s installed generating capacity. CFE also holds a monopoly on electricity transmission and distribution. In 2009, CFE absorbed the operations of Luz y Fuerza del Centro, a state-owned company that managed the distribution of electricity in Mexico City. The Comisión Reguladora de Energía (CRE) has principal regulatory oversight of the electricity sector. Mexico’s national transmission grid, which is operated by CFE, includes more than 31,000 miles of mostly high- and medium-voltage lines. 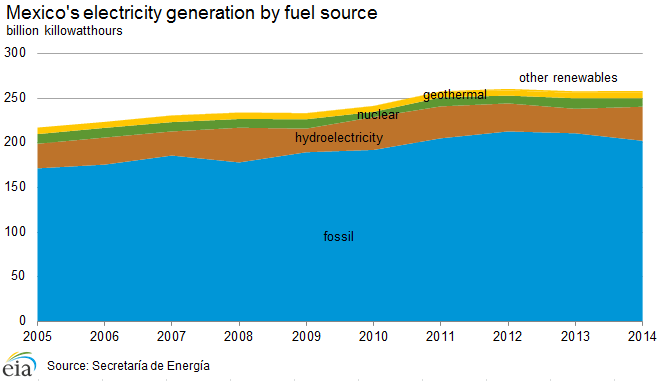 Power plants using fossil fuels comprise most of Mexico’s electricity generation. Although, petroleum products were the leading fuels in Mexico’s electric generation mix, natural gas consumed for electricity generation has risen rapidly in the past decade as price and availability make it a more economic fuel source. 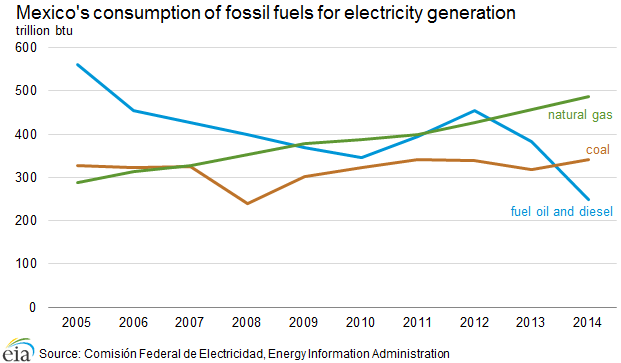 Coal consumption in Mexico rose 21% from 2008 to 2012, although coal represents only 8% of total electricity generation. Mexico is a net importer of coal, supplying 81% of its coal demand domestically. Data presented in the text are the most recent available as of September 21, 2015.